1) Grate the zucchini, potato, and onion into long, thin strands on the large holes of a box grater or with the shredding disc of a food processor. Transfer into a colander and let drain for 3 minutes. Press the vegetables to extract as much liquid as possible and let drain for another 2 minutes. Pick up the vegetables in small handfuls, squeeze out as much liquid as possible and then transfer into a large bowl. Stir in the crackers, egg, salt, and pepper. 3) Working in batches of 4 or 5 cakes at a time, spoon rounded tablespoons of the vegetable mixture into the skillet and gently flatten the mound into a cake that is about 1/2-inch thick in the center. Cook the cakes until the edges are golden brown and they are set in the center, about 2 minutes, then flip them over. (If they bend in the center when you try to turn them, they’re not ready.) Brown the other side, about 2 minutes more. Transfer the cakes to the paper towels to drain. Add a little more oil to the skillet between batches if needed. 4) Sprinkle the hot cakes with a little more salt and serve hot. 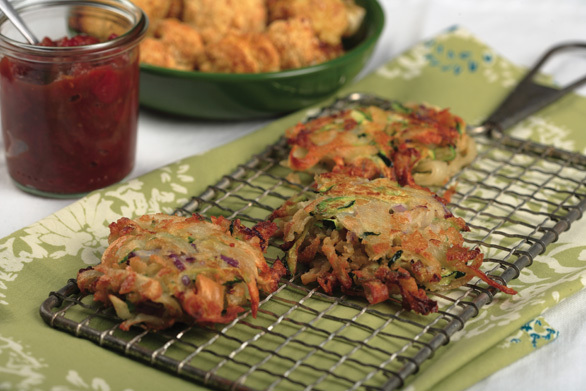 * These little cakes are as crisp as chips on the edges with slightly creamy centers, just like good latkes. They make a great side dish, but they also make a lovely little appetizer when topped with sour cream and caviar or smoked fish, or with something zesty like Tomato Jam.